How it is seen by user? Whale is the common name for a widely distributed and diverse group of fully aquatic placental marine mammals. They are an informal grouping within the infraorder Cetacea, usually excluding dolphins and porpoises. 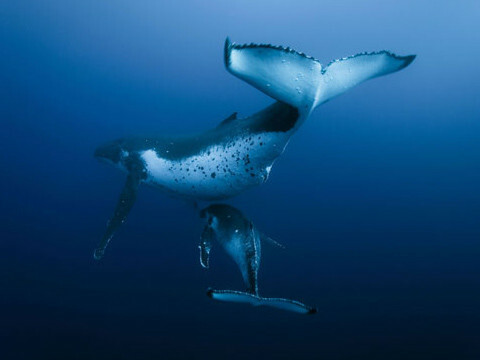 Whales, dolphins and porpoises belong to the order Cetartiodactyla with even-toed ungulates and their closest living relatives are the hippopotamuses, having diverged about 40 million years ago. The two parvorders of whales, baleen whales (Mysticeti) and toothed whales (Odontoceti), are thought to have split apart around 34 million years ago. The whales comprise eight extant families: Balaenopteridae (the rorquals), Balaenidae (right whales), Cetotheriidae (the pygmy right whale), Eschrichtiidae (the gray whale), Monodontidae (belugas and narwhals), Physeteridae (the sperm whale), Kogiidae (the dwarf and pygmy sperm whale), and Ziphiidae (the beaked whales). ungulate, from which they split approximately 48 million years ago. Primitive cetaceans, or archaeocetes, first took to the sea approximately 49 million years ago and became fully aquatic 5–10 million years later. What defines an archaeocete is the presence of anatomical features exclusive to cetaceans, alongside other primitive features not found in modern cetaceans, such as visible legs or asymmetrical teeth. Start your advertising campaign right now! Please fill out the following form so that our consultant could contact you and answer further questions. We are certain that offering format is effective and yielding a high return to the advertiser. We are ready to prove it and give you fist 50 clicks as a gift! Your are the owner of the site with good attendance? Looking for the new way of getting an income earning? If yes, we would be glad to start a new partnership with you! What do you get from this kind of collaboration? If you have questions, suggestions or even great ideas, then write to us! We'll answer within the hour! * We also can set the incentvie game on different web-sites upon your request!